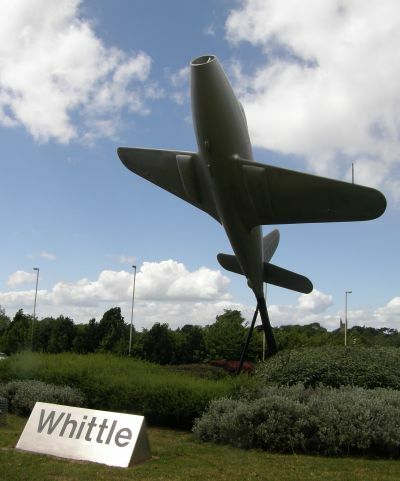 Just 70 years ago the first truly practical jet aircraft, the Gloster Whittle E28, flew for the first time. 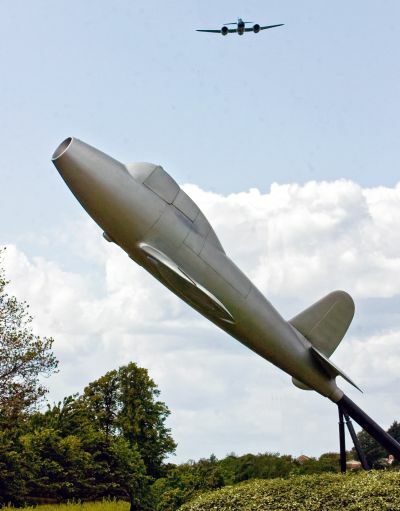 Its birth had been due to perseverance of one man, Frank Whittle, born in Coventry 1907, and for many years a resident of nearby Leamington Spa. Today there is a unique memorial to him on a major roundabout near the village of Lutterworth just off Junction 20 on the M1 (LE17 4HB). Why Lutterworth you may ask? It was here that the industrial company British Thomson-Houston had a works and the engineering support essential if Whittle’s advanced ideas were to come to fruition. It is the true home of the jet engine. Whittle was in the tradition of the great British engineers of Victorian times, slightly mad (eccentric perhaps) and certainly neurotic. An accomplished pilot he gained a first at Cambridge sponsored by the RAF. His original jet patent dates from 1930, the next decade filled with highs and lows as he laboured with his visionary concept. Financial support came in fits and starts and work pressure affected his health. He had a nervous breakdown in 1940. The Gloster E28 made its 17-minute maiden flight from Cranwell, Lincolnshire, on 15 May 1941. On 1 June 1944 the Gloster Meteor F1 was accepted into the Royal Air Force, the allies first operational jet aircraft. It was not until 1948 that a fully practical jet turbine airliner flew for the first time, and this was a propeller jet, the Vickers Viscount. Among its many 'firsts' was the maiden passenger jet crossing of the North Atlantic with designer, Sir George Edwards (and wife) on board. In December 1957 another propjet, the Bristol Britannia was introduced on the London – New York route, followed on 4 October 1958 with the inaugural service by a pure jet, a de Havilland BOAC Comet 4. The Boeing 707 was to follow just a month later. Concorde was introduced by BOAC from Heathrow to Kennedy New York on 22 November 1977. The speed record is held by British Airways G-BOAD in 2hrs 52mins 59secs from takeoff to touchdown on 7 February 1996. According to OAG the present quickest service today east to west scheduled at 7hrs 30mins, although with the prevailing wind around six hours is possible in the other direction. The real question is where do we go from here? When Sir Frank was born no one in the UK had flown in a controlled powered flight, and the ‘planes that had struggled into the air were rudimentary to say the least. Even in the 1940s the idea of getting up to 800 people in the air at one time (as per future Airbus A380s) was but a dream. It is impossible to speculate what will happen in 70 years into the future. Maybe Concorde is as fast as we will ever go. The motor car is now limited to 70mph on public roads in the UK. Perhaps there is another Whittle around struggling to get out. Wireless meant ‘steam’ radio not that far back. The 21st century has a long way to go.